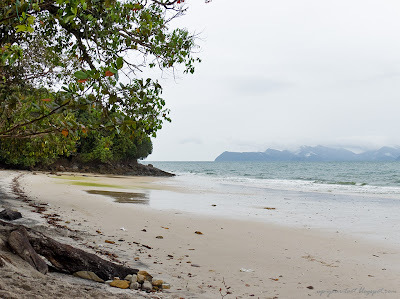 Pantai Pasir Tengkorak is a rather quiet beach on the northwestern side of Langkawi Island. The rather macabre name of the beach, literally meaning Skull Sand Beach or Sandy Skull Beach, should not put one off from visiting this peaceful cove guarded by rocky walls on both ends. The beach faces out towards the Andaman Sea and is guarded by Koh Tarutao (or Ko Tarutao), one of the island of Satun Province in Southern Thailand. This beautiful beach has been given various English equivalents for its Malay name. From Skull Beach to Sandy Skull Beach or even Skull Sand Beach. What is clear is that there is a strong connection of skulls to its name. And why on earth would anyone give such an ominous name to a lovely beach with crystalline sand? Pantai Pasir Tengkorak in Langkawi, Kedah. The island off the coast is Koh Tarutao/Ko Tarutao of Thailand. It was drizzling when we got to the beach late afternoon, hence the overcast sky. Well, there are many stories behind the name of this beach, and some of it is tied to Ko Tarutao. One local folklore has it that in the past, a sea monster lived nearby, and bodies of its unfortunate victims would end up on this beach. Another version of this story is that it was a whirlpool that took the lives of the unfortunate seamen, but with similar consequences i.e. skulls being washed ashore on this beach. A local inhabitant of the beach. The shell looks scary, and probably is the only thing that remotely resembles a skull that you can find on Pantai Pasir Tengkorak. Yet another local story had it that in the past the Garudas and Jentayus (mythical birds) that lived on the nearby island (Ko Tarutao) waged a war. Many humans fell victim to this war and their bodies (and skulls) were washed ashore on this beach. A third story and more a plausible explanation is connected to Ko Tarutao as a penal colony. The island in the late 1930s was used as a penal colony for Thai political prisoners. Due to the surrounding seas that is infested with sharks and have swift currents, attempts to escape the island are usually fatal. And guess where the bodies would end up...Pantai Pasir Tengkorak. The beach is quiet and offers a good place for a romantic walk by the water's edge with your partner. From the way the waves break over his feet, he must be enjoying his walk. His partner on the other hand, seemed a wee bit disturbed by the wet sand. Besides that, support from the mainland was cut off to the penal colony during World War II. This resulted in the guards and prisoners, out of sheer desperation and need, banding together to form raiding parties that preyed on ships that sailed through the waters near this island. The dead victims of these pirates frequently ended up being washed ashore on Pantai Pasir Tengkorak, hence its name. 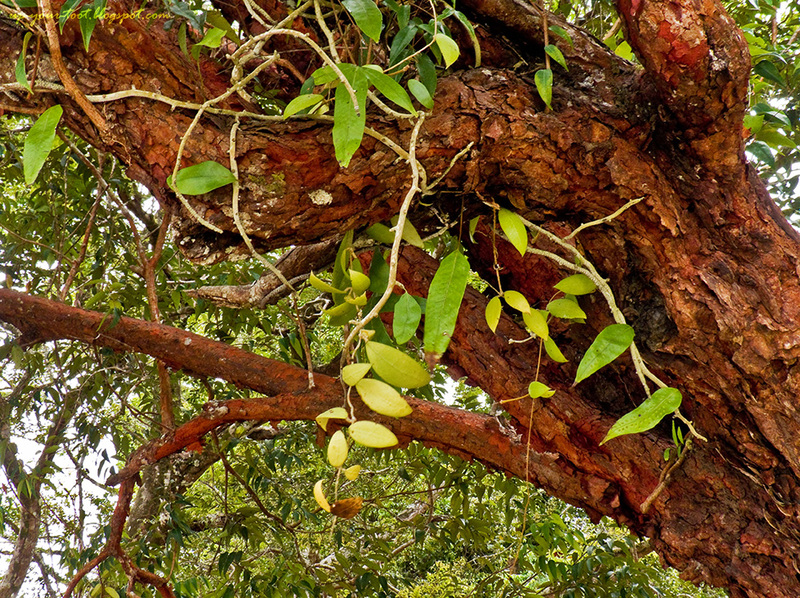 And growing epiphytically on the Syzygium chloranthum are some ferns and Hoya (waxflower). Unfortunately, I didn't catch sight of any Hoya vines with flowers. Nowadays, this beach is peaceful and sees only a handful of visitors due to the secluded location of the beach. 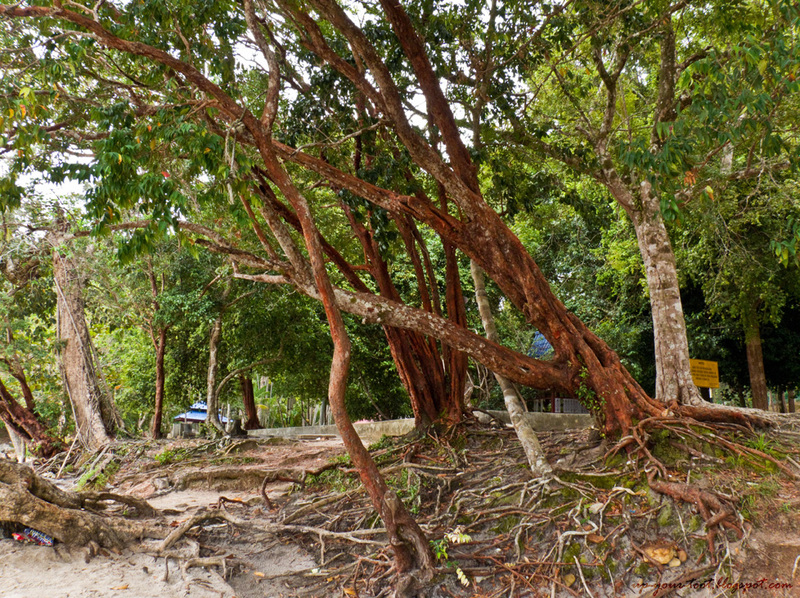 It is part of the Pasir Tengkorak Recreational Forest (Hutan Lipur Pasir Tengkorak) and there are tables and chairs provided on the park grounds before the beach. Just by the beach, there are some basic amenities such as toilets, changing rooms and also prayer rooms for Muslims. On weekends and public holidays, there are a few stalls and vendors that ply their trade outside the gate. A signboard by the entrance to the beach. A very good definition of forest. Rabbit's Paw Fern (Drynaria sp.) on a tree in the recreational forest. 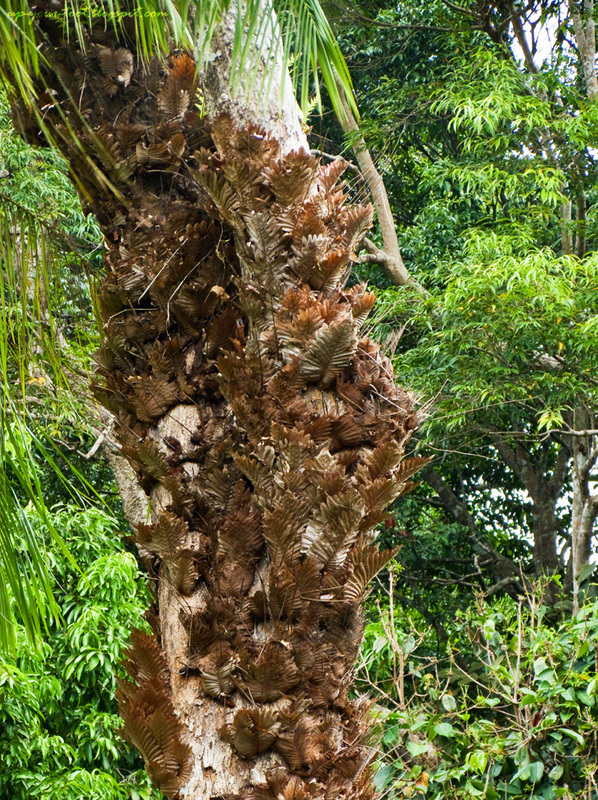 The dry weather in the previous months had left the fern dormant with only the dried, sterile detritus leaves still attached to the rhizome. On the right hand side of the beach, there are some interesting rock formations and steps that supposedly lead to another part of the beach which we didn't explore. The rock formations on both sides of the beach (very visible on the right hand side) are examples of sedimentary rocks from the Machincang Formation that formed during the Early to Late Cambrian period (about 550 - 500 million years ago!). 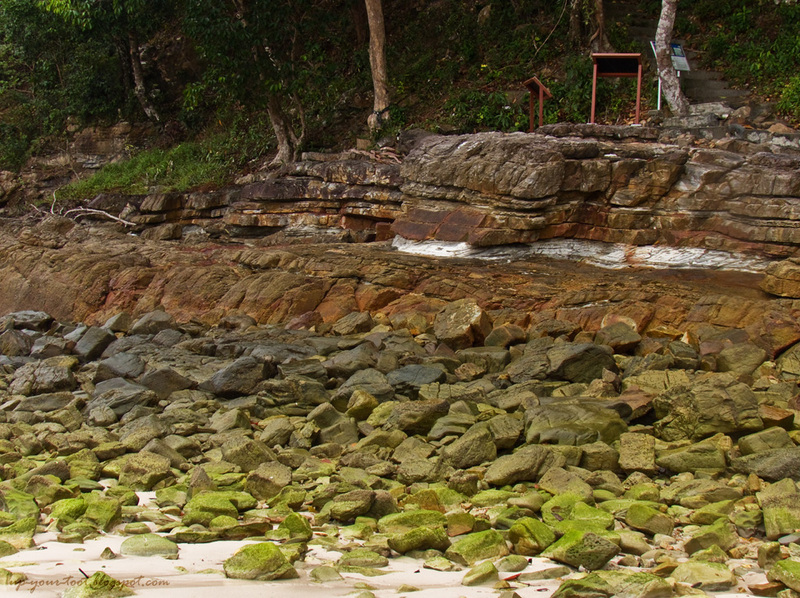 The rocky walls on the right side of Pantai Pasir Tengkorak. These rocks are from the Machincang Formation. 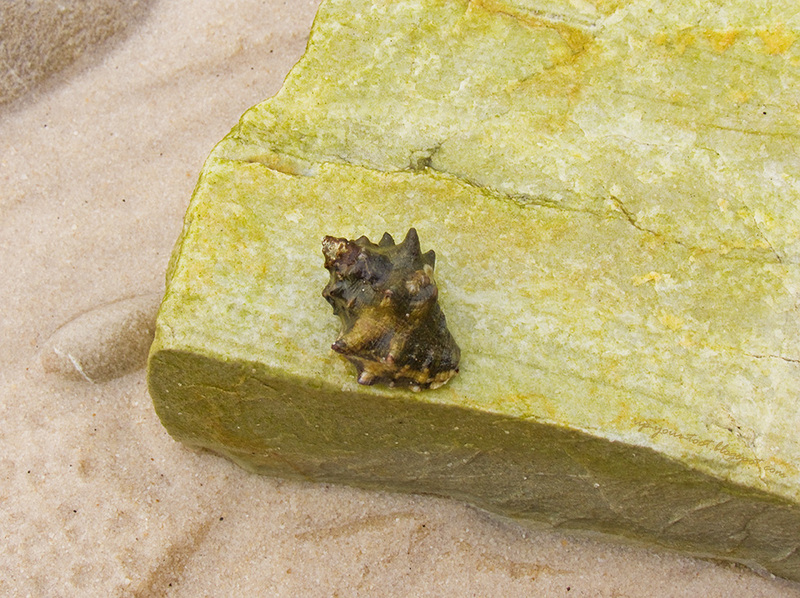 The stones on the beach (green with algae) are strangely pitted. Just above the high tide mark, one can see that the rocks are sedimentary in nature, made up of layers of sandstone and shale. The Machincang Formation is predominantly made up of fine to medium-grained sandstone with subordinate coarse-grained sandstone, conglomerate and shale (Leman et al., 2008). At that time, Langkawi was part of Gondwanaland. If one takes a good look at the sandstone and shale found around this area, one can see that Mother Nature had carved some strange and somewhat grotesque patterns on these rocks. If you are coming from Kuah town, head towards Datai. For example, we came from Kuah town, hence we went through this route. If coming from the northern side, go down Jalan Teluk Yu until you reach a T-junction to Jalan Datai. There is a foodstall here called Kafe Simpang Datai. Turn right into Jalan Datai and continue on until you see the sign Hutan Lipur Pasir Tengkorak and a turning to your right. There's a parking area beyond the gate. If you see a tunnel, you have overshot the place and reached Temurun Falls further down the road. In that case, turn around and head back to the Jalan Datai-Jalan Teluk Yu junction. 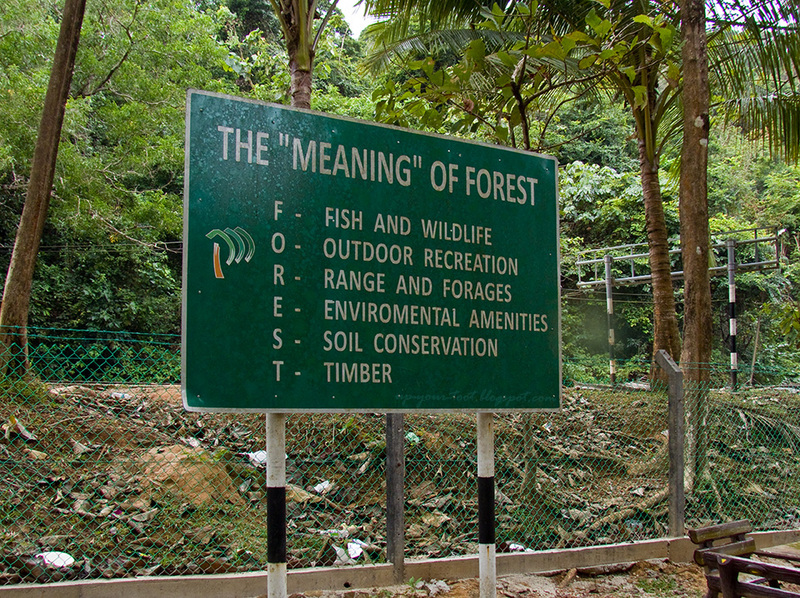 The signboard and turning into Pasir Tengkorak Recreational Forest is on your left and highly visible. If you come from the direction of the Langkawi Cable Car (from the south), go down Jalan Teluk Burau towards the Danna. Follow Jalan Teluk Yu and at the T-junction with Jalan Pantai Kok (where you can see Telaga Habour), go straight on Jalan Teluk Yu. You will pass by Pusat Penyelidikan Langkawi UKM and Customs housing complex in a short while. Continue to follow the road and turn left into Jalan Datai at the intersection of Jalan Datai-Teluk Yu (this junction is clearly marked plus the Cafe/Kafe Simpang Datai is a highly visible landmark). Follow the road (Jalan Datai) until you reach the destination (Hutan Lipur Pasir Tengkorak). Thanks and glad you liked the story. Even in bad weather (rain and strong winds) my colleagues and I felt that the beach was beautiful. There's another beach further up along Jalan Datai that is interesting as well. Just that it takes quite a long drive to get there. Btw, if you happened to head that way, drive with the windows down to listen to the orchestra of Mother Nature as you go along Jalan Datai - the birds and insects makes lovely music. Oh bestnya main-main gambar boleh kasi scroll sana sini. Rasa nak tekan like macam di facebook je tengok definition FOREST. Bestnya kalau dapat tenangkan fikiran di sini. Definisi FOREST tu memang bagus kan? Semua kawan-kawan yg nampak suka sgt dgn definisi tersebut. Kalau ada gambar yang diambil secara berturutan dan ada overlap, boleh je ke CleVR.com untuk 'stitch up' menjadi panorama yang boleh scroll. Lepas tu embed dalam blog, hehe. I biasa guna Photoshop untuk membuat panorama, cuma upload kat site tu je sebab they host it free.